Tis the Season to be Jolly !!!! So where do we start about the last 12 months? It’s certainly been an interesting time. Lewis had every intention of posting far more blogs about photography, but since completing his photography qualification he hasn’t actually taken that many photographs. This MUST change for 2013!!! Kim sat and watched The Great British Bake Off, oh god what a mistake that was!!! After watching a few episodes, Kim thought it would be an excellent idea to buy Mary Berry’s baking bible and then choose one recipie a week. Well what’s the point in setting yourself a challenge if nobody knows about it? This is where Lewis came up with the idea that Kim should blog about her baking experiences and share it with those who were interested and wished to read or follow the blog. Hence Kim’s account on WordPress was created……. Has it been a success? Well we certainly think so and we would both like to thank our new followers, not forgetting our existing ones, this year and hope that this blog has bought some interesting reading as well as enjoyment. Due to having a lack of function in his arm, Lewis hasn’t really done much, but hopes to be far more active in 2013. Lewis hopes without a doubt that not only will he be able to take plenty of beauitful images, but that people may even wish to purchase the images created by Lullingstone Photography, better known as Lewis & Kim…. So what else has happened? Oh yes, we nearly forgot. Lewis’ parents decided to downsize from what had been his childhood home and so where do they move to? Well of course it has to be next door to us!!!! Then of course we have the Olympics and Paralympics!!! WOW is basically all one can say about that. Whether you like sport or not, no one can deny that we have had the most incredible year of sport. The achievements of our various sports men and women in their respective disciplines has been absolutely incredible. The Olympics seemed to be over in a heartbeat which is something we can’t say about the build up to it. How many years did we have the media bombarding us with Olympic gems? Far too long would have been the answer. So the whole of the UK were in awe of the competitors and for very good reason. They were ALL truly inspirational, whether they were winners or losers… In our eyes, they were ALL WINNERS !!!! Generally speaking it has actually been a rather quiet year, until we got to December. Kim had been having some pain and so goes to see the GP. After some investigations, she finds herself with a rapid referral to the hospital and told that surgery is needed….. So we’re waiting for a date for surgery on the NHS…. Well that’s likely to be a few months then right? WRONG !!!! A letter came through from the hospital a few days ago and the date is……. Yep, it’s New Year’s Eve!!!! We certainly won’t forget this year in a hurry. We wish you all a very joyous and Happy Christmas and hope that you have a prosperous New Year. We hope that 2013 is good to you all and is even better than 2012. I know I haven’t blogged anything for over 6 months now, maybe that’s because not much has gone on in my life that I felt anyone would wish to read about, but this subject has angered me so much and made me sit down and start typing…. What is Breed Specific Legislation? Well it’s basically exactly what it says on the tin, although it mainly focuses on “bull breeds”. In the UK this is particularly the case for the American Pit bull, to name just one. So why the fuss? Well the law doesn’t actually state Pit bull as such, it in fact says Pit bull TYPE and that is where the issue lies. 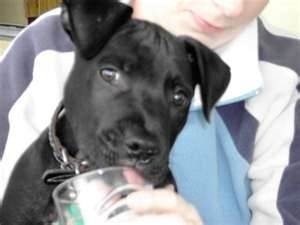 Over the past 2 years the biggest case has been over a dog in Belfast, Northern Ireland called Lennox. 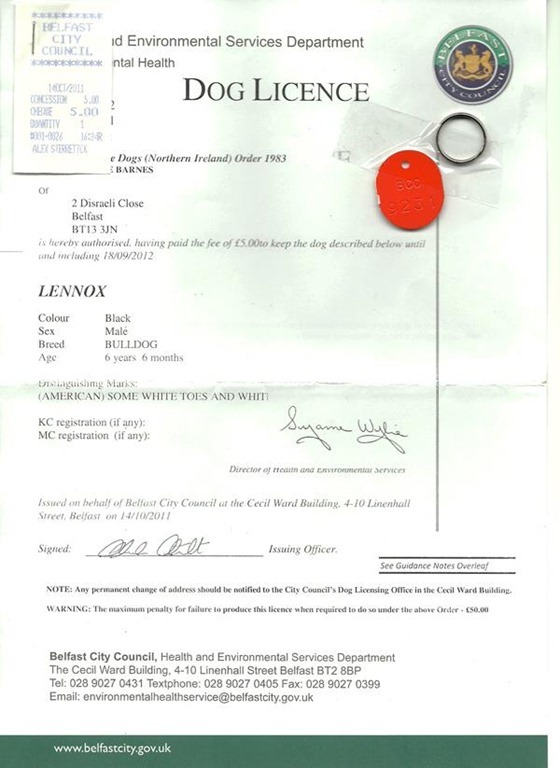 In Belfast all dogs have to be licensed with Belfast City Council and in Lennox’s case his license stated that he was a BULLDOG, no mention of the word Pit bull anywhere !!! OK so from birth Lennox was classified as a Bulldog until 2 years ago when Belfast City Council’s dog wardens, whilst “raiding” the house by mistake, decided to take a tape measure to Lennox’s head and so decided he was of Pit bull Type and therefore was an illegal dog. 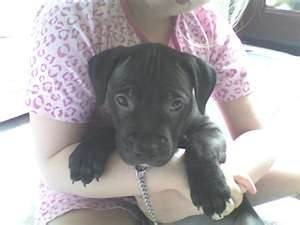 Whilst Lennox’s owner, the Barnes family, refused to turn Lennox over, the council applied for an injunction and returned to seize Lennox and lock him away in an undisclosed dog kennels, where he would then become the responsibility of the Council for his welfare. Naturally the Barnes family were not going to give up on their “young man” and so the legal battle began!!! A legal battle between the owners of a dog who just didn’t look right and a local government authority, Belfast City Council… After battling it out through the courts the council won their right to put Lennox to sleep, a decision which has created World Wide anger even with a 200,000 named petition to save this poor dog’s life, but of course councils being councils weren’t going to back down and wanted to make sure they were going to get their way…. According to Belfast City Council, Lennox was humanely put to sleep on Wednesday 11th July 2012 at approximately 7:00am BST. There is far to much about this case for me to write and re-write what has already been said. To be perfectly honest I don’t see any point in re-inventing the wheel, not to mention that it’s difficult enough for me to write about this as it is, but I would draw your attention to the editor of Dog’s Today magazine, Beverly Cuddy’s – Cold Wet Nose Blog where Beverly has written some interesting articles about the whole Lennox case. Someone else whose work and comments on this case are extremely important is Jim Crosby, a Canine Aggression expert from the United States. The article he has written makes complete sense to me and the video he shows in the of Lennox’s behaviour certainly does NOT show a dog displaying any kind of aggression or any aggressive tendencies. I urge you to go and read this gentleman’s article by clicking on his name. Is Breed Specific Legislation Right? Or should it be punish the Deed NOT the Breed? Thank you for taking the time and having the patience to read my article. If you wish to post any comments then please do so and I will try and reply to them all as soon as I can.